Ralph Waldo Emerson believed that "The Earth Laughs In Flowers". He would be smiling if he could view all the blog blossoms. We have two very special ladies who encourage us to bloom as we create our flowers. Carol (Just Let Me Quilt) is our own personal cheerleader while Mdm. Samm (Sew We Quilt) inspires us to create sew many things. Thank you ladies. Welcome to my version of a fabric flower garden. A watering can is essential for any healthy garden. And who can resist bunnies hopping about. I stitch Sunbonnet Sue theme blocks. Someday I will have enough for a quilt. Sue waters her flowers while her fan club members stand guard. I was asked to create a banner for our local gardening club. I went to an initial meeting with a sketchbook, ideas and fabric swatches. Among the fabric samples was a panel with birds. They loved it. I am glad we have fabric artists who gift us with wonderful images. Quilting around the birds and flowers, applique names and the addition of a songbird fence gave them a very pretty banner. When my sewing machine was new I practiced the stitches on this hanging which I gave as a gift. I saw it recently during a visit and thought it would be an interesting subject for Say It With Flowers. Still a saucy cat even if he is facing the other direction. Must be catnip in the flowers. Thank you for strolling through my garden. Check out the other blooms at today's blogs. Frances your projects are just so darling and love the colors! Thanks for sharing. Wow, you have a beautiful garden. I especially love the watering can quilt in the beginning. Your use of color is wonderful! Lovely quilts and the banner is beautiful! Thank you for sharing. Love your bunnies! - a lovely fabric flower garden! Lovely projects, especially the banner! Thank you for showing us those beautiful flowers. Lovely work! All of your projects are so lovely. Thank you for sharing with us. Sew very cute. Love the bunnies! Your projects are so beautiful. Thanks for sharing your creativity and being part in this blog hop. How delightful!! Good luck on creating enough Sunbonnet Sue blocks for a whole quilt!! I like all your little quilts! I would love to see your Sun Bonnet Sue quilt when u finish it! Great projects, especially the watering can and the cat by the vase! Thanks for sharing! All of your projects are whimsical and that saucy cat is too cute ! I love the cloud fabric, it looks just like he's sitting in a window. What wonderful projects! Thanks for sharing! I adore the watering can quilt, and the rest of projects are all wonderful too! The stroll through your garden was wonderful...I just love the watering can and your colors are beautiful..thanks for sharing. So many beauties here, so glad you shared with us today! Beautiful! Your watering can quilt is so bright and cheerful. I can't even pick a favorite. I love that each piece has something that is almost in motion. Like the cat about to lay down and take a nap, the water coming out of the can, and the bunnies hopping around. Frances. What fabulous creations. I absolutely love the watering can with flowers and bunny. A wonderful combo. Thanks for sharing your other flower inspired quilts! Totally charming projects on display here. What lovely wall hangings you are sharing today, Frances! You had me right from the top with the flowers and watering can. I think that is my favorite piece though the cat would be a close second. I bet those Sunbonnet Sues are going to make a wonderful quilt when your blocks are all finished and joined in the top. THX for sharing with us today. Emerson would indeed love this hop! Beautiful work. I especially love your watering can quilt. You do lovely work. Beautiful workmanship- love all of your hangins! So many lovely quilts. Thanks for sharing your garden of quilts today. Love all of your projects. Sunbonnet Sue is my favorite. Thank you for sharing. You have been very busy creating lovely projects for this hop! All are wonderful. Pretty teapot too. Wonderful projects. I like them all. And I like the cute bunnies in the corner. Wow, what beautiful projects you have. I love them all. If I had to choose....well, I would pass. Thanks for sharing all of them. Sew very cute! I love the gingham flowers and the cats are terrific. I really love your bluebird teapot too! Your flower garden is beautiful! Que delicadeza! Lindos trabalhos, adorei. I enjoyed your flowers today, thanks for sharing. The banner is just gorgeous!! All of your projects are so pretty and spring like! Great job! Lovely flowers in your garden! gorgeous projects! I love them all. Fabulous projects - my favourite is the watering can! Great flowery projects. That banner came out really well. 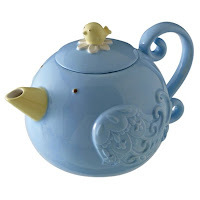 I like your cute tea pot too! All of your projects are great. My favorite is the watering can. Love the teapot!! You made so many beautiful creations!! Love the watering can , well all projects are lovely , great work Frances . Very nice projects, I am a fan of Sunbonnet Sue too. She has been around a long time and still going strong..
Love your Sunbonnet Sue block! Your work is lovely. I am so glad I stopped by. Thank you. I love all your flowery projects. The watering can is fabulous! I loved your watering can project, your Sue, and your kitty project. You have good taste if I do say so! Your flowery projects are all really lovely, thanks for sharing. Yes, RWE would be pleased to see all the flowers! I loved your projects though "bunnies" aren't appreciated in my 'real' garden! If I don't put up a fence, they gobble up all those lovely, tender sprouts. All of your work in flowers is wonderful but I love the cat. Thank you. Piękne projekty ! Beautifull !! All your projects are lovely! Great job! Your pieces are fabulous and if I had to choose a favorite.. It would be the one with the cat! My friend would love that! Lovely flowers. Sunbonnet Sue is always such a cute piece. Thank you for sharing your garden with us. Love the watering can/bunnies mini. Hi!!!! Love all of your flower creations!!! Love love the kitties!! !